Taito's NESiCAxLive platform hosts regularly new releases of popular games. Tomorrow, King of Fighters series will be honoured with two titles: KOF 98 Ultimate Match Final Edition and KOF 2002 Unlimited Match. 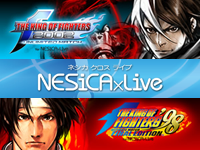 Thanks to NESiCAxLive system and to increase interest to these releases, new features are added. Players data (name, statistics, performance) are saved on NESiCA card. Furthermore, KOF 98 UM Final Edition, unlike KOF 98 UM Hero, is an official version by SNK Playmore. Characters are more balanced and game response is improved by the use of the new "FAST I/O" interface. 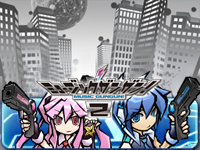 Two other games will be also released tomorrow: Spica Adventure (Taito) and Senko no Ronde DUO v2.00 (G.rev). To celebrate Pac-Man's 30th Birthday in 2010, Namco America has organized a series of events: a website, mobile games, an interactive Google logo, goodies, and especially the announcement of a new arcade game: Pac-Man Battle Royale. At Amusement Expo 2010, Namco America unveiled the game to the public. Then, Pac-Man Battle Royale was presented at Electronic Entertainment Expo (E3) in Los Angeles before more than 45,000 visitors and stole the spotlight from the games console ... Pac-Man Battle Royale is the first Pac-Man arcade game to be playable up to 4 players in a competitive mode. 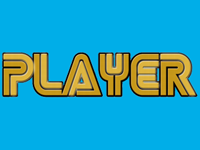 The original concept was revised: now, to win the game, the player must eat the other to eliminate them and being the last survivor (so the title). When a player eats a power-up, his size is doubled and his speed increases. Once powered up, he is able to eat the other competitors and ghosts. Two Pac-Man of the the same size will just bounce off each other. Ghosts are also dangerous becaue they can eat Pac-Man. Eat a fruit or every power-up reset the maze with a set of new power-up. At the end of the game, statistics such as "Most Rounds Won" and "Ate Most Pac-Man" are displayed for each player. 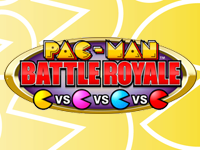 Pac-Man Battle Royale is available today in the U.S. To get the latest info about the game, visit the official Facebook page. 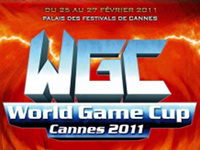 EAG 2011 starts in 4 days, many people consider video games as the weakest link of the Amusement industry. However, many new titles will be showcased at the show, here are some of them: Bandai Namco Games: Dead Heat (racing game with PIN code and social features), Pac-Man's Arcade Party, Pac-Man Battle Royale - Injoy Motion: Dido Kart (MDX-4), Power Boat GT (deluxe), Top Gunner - Rassen: Vulcan M (final version), Raw Thrills: Big Buck World, Fast & Furious Super Cars, Super Bikes 2 - Sega: GRID, Let's Go Island, Sega Golden Gun, Sonic & Sega All-Stars Racing Arcade (racing game with illuminated seats and ticket dispenser, up to 8 players), Super Monkey Ball Ticket Blitz - Taito: Elevator Action Death Parade. Not to be missed: a seminary by Frank Seninsky (president of Alpha Omega group, former AMOA president) about the key rules of redemption and how the layout and design of a gaming space is critical to its success (number of needed games and space, estimate revenue, cash or tokens, ...). 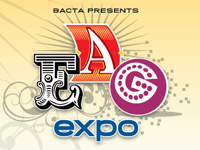 Of course, the show doesn't stop there, it's the chance to discover all the latest products in redemption and gaming. So all operators are encouraged to go to ExCeL London on Tuesday, Wednesday or Thursday! If you can't attend, our annual report will provide a detailed analysis a few days after the end of the show. 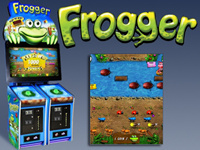 A brand new Frogger game was just released! Developed by Raw Thrills and Konami, this game retains the gameplay of the 1981 original version enhanced with beautiful 3D rendered graphics. ICE took care of the cabinet design and manufacture, equipping it with a 42" LCD screen, a 2 player control panel and a ticket dispenser. Number of granted tickets depends on how far you get. Location tests held for 6 months show that this is one of the highest earning redemption game of all times. No doubt the popularity of the license and the addictive concept of the game are decisive factors! First machines started shipping on January 14th. Since its release last June, Hatsune Miku Project DIVA Arcade is regularly updated by Sega: 3 revisions are already out each bringing new songs and new costumes. 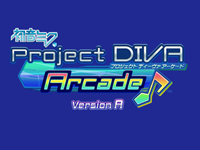 Today, it's a new version that comes out: Hatsune Miku Project DIVA Arcade Version A. More than a simple update, this version introduces 2 new modes: DUO mode (highly anticipated by fans) and Contest mode. New songs are also added and the playlist has been revised so that more titles appear on the screen which makes the choice easier. To upgrade to this version A, operators must already have installed revision 3 on their machine. Futhermore, Hatsune Miku Project DIVA Arcade Version A is compatible with Aime card (phone card which also serves for electronic payment) from NTT DoCoMo. During IAAPA Attractions Expo, Andamiro unveiled its new Pump It Up FIESTA EX model. 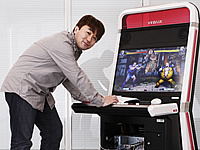 The game was showcased in a new designed cabinet featuring a 50" widescreen 50 (improving resolution and refresh rate) and an improved response and solid dance pads. To maximize audio performances, Andamiro R&D team integrated two high quality subwoofers and four tweeters. Andamiro has also implemented a synchronization program that coordinates LED lighting and rhythmic frequencies to produce beautiful rhythmic effects during a game. 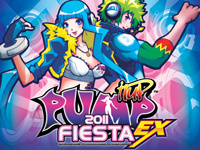 Pump It Up FIESTA EX offers about 350 songs (most in the history of Pump It Up) and more than 2,000 step charts.